Granada is the capital city of the province of Granada, in the autonomous community of Andalusia, Spain. One of the main tourist attractions in Granada is the Alhambra, a grand Moorish fortress, with beautiful gardens and spectacular architecture. 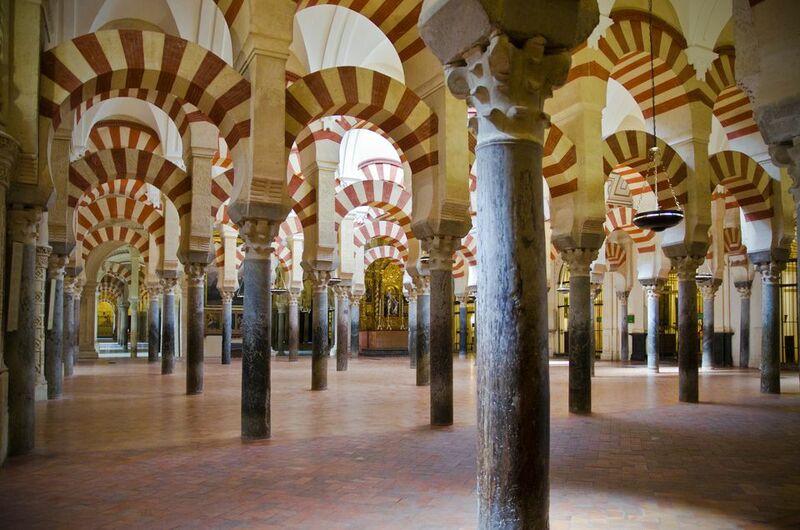 Cordoba, located about three hours from Granada is a recommended side trip. Cordoba is home to what was once the biggest mosque in the world, as well as a famous Jewish quarter, and an old town that feels more like a village than a major city. If you are basing your explorations in Granada, a day trip to Cordoba would be enough to get a sense of this historic city. When traveling to Cordoba from Granada, there isn't much difference between train and bus journey times, but the bus is a lot cheaper, so many take the bus. There are no flights from Granada to Cordoba so air is not an option. However, if you have some travel options, it makes much more sense to visit Cordoba from Seville, which is connected to the city by the high-speed AVE train (it takes just 45 minutes). This is all the more reason to stay in Seville rather than visit as a day trip. It makes sense to stay there for a few days and make day trips from there. The bus from Granada to Cordoba takes between two-and-a-half and three hours and costs around 15 euros. There are nine buses each day running to Cordoba. You can buy tickets from Movelia or from GoEuro. The train from Granada to Cordoba takes two-and-a-half hours. There are two trains per day. You can book the ticket with Rail Europe, however it will be more expensive than the bus option, even though they both take the same amount of travel time. Driving from Granada to Cordoba takes about two-and-a-half hours as well. The easiest route is to go on the A-92 and A-45 roads. It's also not hard to rent a car in Spain if you choose to take a road trip. No matter how you arrive, one of the most popular sights is La Mezquita, an immense mosque dating from 784 A.D. decorated with Byzantine mosaics. The Mosque became a Catholic church in 1236, and a Renaissance-style nave was added in the 17th century. Once you've finished visiting the mosque, walk up through the old town, with the numerous handicraft shops (all locally made), to the Jewish quarter. Cordoba is the perfect size for a walking tour. Your guide will show you the most important sights in the city in under four hours. And with the tour running in the morning, it gives you the perfect introduction to the city before spending the rest of the afternoon on your own. The bus station and train station are side by side, which is convenient, and from there it is a 15-minute walk to downtown. The main square is Plaza de las Tendillas, a commercial center.